Wrexham goalkeeper Daniel Bachmann says he is fit for their home Conference Premier game against Bristol Rovers on Tuesday, 2 December. Bachmann had been expected to be out for at least three months with a torn medial collateral ligament in his knee. The Austrian Under-21 international, on loan from Stoke City, collided with the frame of the goal during the 2-1 defeat at Torquay in October. On Monday he said: "It's up to the manager [Kevin Wilkin]." 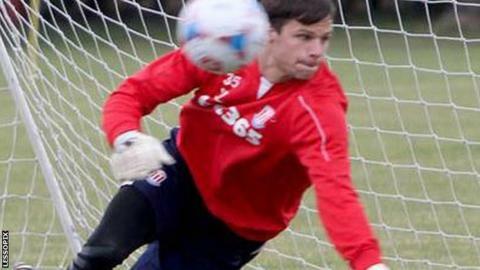 "I've been training with Stoke the last week or so and getting back to full fitness. I'm ready to play." Bachmann signed for the Welsh club until the January transfer window. The 20-year-old's misfortune has provided an opportunity for understudy Andy Coughlin to stake his claim for a regular starting place.